During European Shark Week, October 2010, , European divers voiced support for a stronger European shark finning ban by contacting their local Members of the European Parliament (MEPs). Project AWARE is pleased to announce that our collective voices have been heard. Today, the European Parliament endorsed a resolution on shark finning calling on the European Commission to deliver a proposal prohibiting the removal of shark fins on-board vessels. “I would like to thank EU citizens for encouraging us to take action. It sends a powerful message to EU decision makers that these valuable yet vulnerable species must be protected,” commented Jean-Paul Besset, MEP, France, Greens/European Free Alliance. The Written Declaration 71/2010 on shark finning achieved a majority with 423 of the 736 MEPs adding their names. The declaration, launched in September by four MEPs: Jean-Paul Besset, Chris Davies, Sirpa Pietikäinen, and Daciana Octavia Sârbu, from the ALDE, EPP-DE, Greens-EFA and S&D groups, is now adopted by the Plenary of the European Parliament. Endorsed as a Resolution of the Parliament, it will be forwarded to the European Commission, who last month launched a public consultation on options for amending the regulation, including a ban on at-sea fin removal. Written Declarations don’t have automatic legislative effect. However, having the declaration passed will make it much easier to achieve the necessary legislative support in 2011 There will be a legislative proposal from the Commission next year that the Parliament (and council of ministers) needs to agree under the ‘co-decision’ process set up by the Lisbon treaty. Project AWARE (a steering group member of Shark Alliance) was pleased to support MEPs in this initiative. 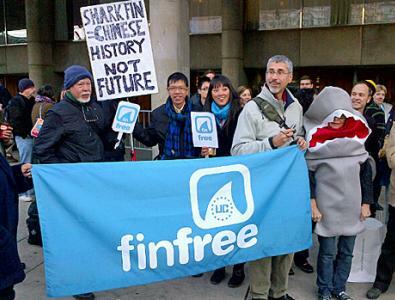 Enforceable finning bans are one integral part of the bigger picture of shark conservation. Our battle for improved shark conservation measures around the world continues. “Sincere thanks goes out to divers and EU Citizens around the world for making MEPs focus on shark finning over the past few months,” added Domino Albert, Project AWARE Foundation Marketing and Fundraising Coordinator. You can find out more about shark finning and ongoing work to protect these remarkable species including the “Give Sharks a Fighting Chance” campaign at www.projectaware.org.